Drawings on the nails – a great way to express your emotions and share them with others. Bright coloured patterns slightly diversify your daily routine and bring the image of something vaguely interesting and new.Masterpieces on nails are a variety of tools and using all sorts of technology. On our site we have already talked about this. Today we talk about how to make a beautiful manicure with nail using a special long tassel. Such a drawing tool on the nail surface is referred to as “nail-liner.” Beginners and advanced design creators will appreciate the benefits of a successful invention of the world of nail art. Comfortable thin brush allows you to create a neat and graceful figures-liner lacquer on the nails. Because the nail-liner comes with elongated brush drawing process on nails brings a lot of positive emotions. As such, you can draw the small brush elements and subtle details, simple pattern can turn into a luxurious composition. With such a varnish, you will create the perfect jacket with a clear and accurate line of a smile. Also easily performed geometric shapes and abstract designs. 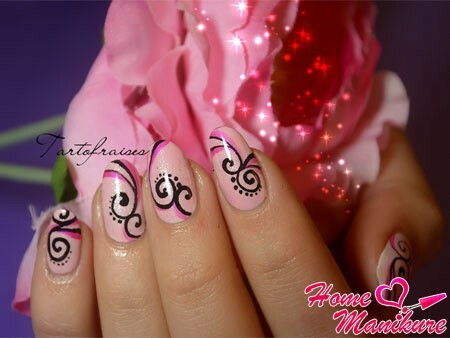 Starting with simple patterns, you will quickly learn how to create a whole pattern on nails. Availability. Usually drawings on the nails are created with a brush for nail art, watercolor paints or gel. But in order to get a set of several shades you have to spend considerably, while the varnish with a fine brush will cost 3-4 euro. For example, a popular manufacturer of Evita offers buyers of 9 ml bottle for only 3-5 euro. Despite the small amount of such capacity will be enough for long. Comfort. Girls who are accustomed to the usual paint varnish, easy to use liner note for nail painting. After the process of creating a broad brush floral or abstract compositions thin tool brings more aesthetic pleasure. Filigree patterns. Varnish-liner with its ideal for painting with a brush, you can create not only a clear and elegant design, but also highlight some minor details on the nails, not afraid to spoil the finished ornament. Brush, tapering towards the tip, has a thickness of 1.3 mm, which allows to realize the smallest pattern on the surface of your nails. Fine lines and elegant contours add a touch of elegance to your manicure lightness and airiness. Resistance. In compliance with all the rules of art painting pictures made with a special varnish for a long time will please its possessor great condition. Do not forget about using a base and a top coating to create compositions. This will prolong the life of your manicure, making it more resistant and durable. When operating with such a varnish may arise some difficulties. We assign these points to the shortcomings of the liner. Need for experience. Of course, we all want our nails adorned with incredible figures, brought to life with his own hands. First, you need to master a simple pattern as twigs, flowers, petals, geometric shapes. Hone your skills to the composition has clean lines and tidy contours, and then proceed to more complex patterns. 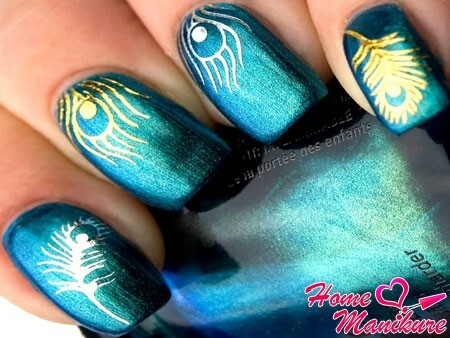 A little patience and time, and you will obtain just gorgeous pictures on nails. Thickening of the nail. Many women complain that the liner in bottle very quickly thickens.However, if stored properly varnish material is very long retains its original quality does not deteriorate. Gentle or, conversely, catchy manicure with patterns set you apart from the crowd. Observe the main condition for any nail art: make sure that the pattern on the surface to nail harmony with the chosen way and match the style of its owner . Pick a shade of nail painting to suit your individual preferences, but do not forget about the importance of the combination of all colours manicure together.Contrasting patterns in the correct execution will look very impressive and stylish. Nail liner is indispensable when drawing lines smiles during execution of his tunic. Nail tip can be filled not only white, but any other color, experimenting and applying new ideas. More inspiration you give our wonderful collection of photos where you can see a lot of design options made using lacquer with a fine brush.